On October 19, 1961 the Belvedere Hotel burned to the ground making way for the purchase of the land and construction of Belvedere Heights in 1965. Thus, a 101 Bed Long Term Care Facility located on Belvedere Avenue overlooking beautiful Georgian Bay in the Town of Parry Sound was built. The Home is operated and maintained by a Board of Management for the District of Parry Sound in co-operation with the Province of Ontario Ministry of Health. So often we speak of heritage as buildings and locations. Belvedere has had a wealth of heritage in its many residents. Their history has helped to build this country. They have fought for our freedom in wars and developed the communities that make up the District of Parry Sound it serves. Over the years there have been exciting times and many famous people take up residence. Two residents fell in love and were married at the Home. They had a traditional bridal shower, bachelor party, a ceremony in Belvedere’s chapel followed by a reception and square dance in the Auditorium. 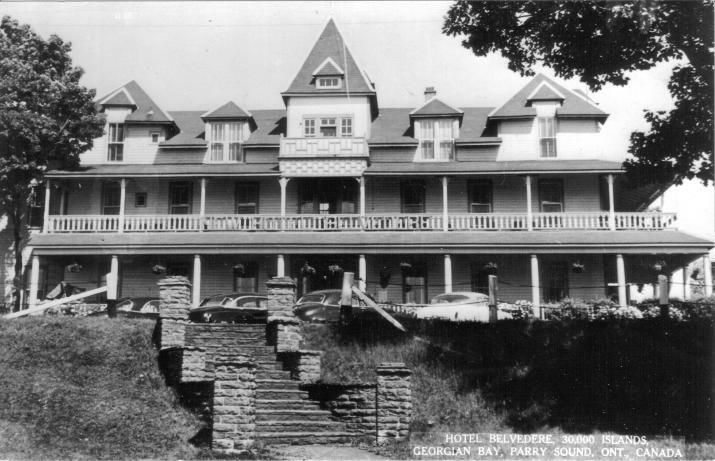 Many people from our community including nurses, mayors, teachers, war veterans, and former board members have made Belvedere Heights their “home.” A local historian who compiled thousands of Parry Sound and area pictures into slides has recently enhanced the Belvedere population. For some of the long term staff, family members became friends and were so impressed with the care at Belvedere; they have now become Residents themselves. There has been several staff members from the early days spend the final chapter of their lives enjoying the spectacular sunsets over the bay as well. They have witnessed many positive changes throughout the years and are proud to take part in the vital Residents’ Council and activities within the Home. The lives of staff are enriched as they spend time hearing about the “good old days” and work together to make the present days and future fulfilling and rewarding for everyone. Many Family Members have lost their loved one, but remain as part of Family Council and serve as Volunteers within the Belvedere Community. Their valuable input ensures excellent quality care is continued and the void in their lives is filled by serving the current population. Helping in the Fireside Café, feeding, assisting with programs and appointments are just a few of the services provided by a dynamic group of Volunteers.